This beautiful state Park is also one of Georgia's most popular. Its location on Lake Allatoona is one reason why it attracts so many visitors but the park provides much more than a chance to fish, go boating, or go swimming. Red Top Mountain is also within easy reach of Atlanta. It is a relatively short drive for Atlantans that want to find a place to where they can spend some time relaxing in a beautiful natural setting. This website provides information about the park that can help you learn about what the park has to offer and plan your next visit. You can continue to scroll down this page to get an overview of Red Top Mountain State Park and its amenities. You can also use the navigation links on the side or bottom of this page (and found in the text below) to find pages with more in-depth information about particular aspects of the park's features. There is no gated entrance to the park. Visitors are required to pay a $5 per-vehicle day use fee. You can also purchase an annual pass for $50. This annual pass is good at all of Georgia's state parks. There is an entry fee/entry booth along Red Top Beach Road, which is the the road that leads to the swimming area. You can pay your entry fee there and obtain information about the park. Along the main road through the park (Red Top Mountain Road) is the visitors center. It serves as the camping check-in office, a store (drinks, snacks, and souvenirs), and park information center. You can also pay your entry fee here. Red Top Mountain Lodge - Features 92 guest rooms ($75-$130), wireless internet, meeting space, a restaurant, and catering. The facilities can accommodate conference groups, parties, and weddings. There lodge also has a swimming pool, which is available for the exclusive use of the park's lodge and cottage guests. Cottages / Cabins - There are 18 cottages in Red Top Mountain State Park ($100 - $135), two of which are dog friendly. Mountain Biking - The Iron Hill Bike Trail is a 3.9 mile shared use (hiking and biking) gravel path. 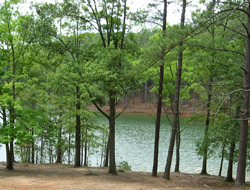 It includes sections along the banks of Lake Allatoona. Allatoona Lake - BOATING - There is a privately owned full service marina in Red Top Mountain State Park where you can rent slips, buy gas, visit the marina store, and rent boats. There are also boat ramps available for use by park visitors but they are currently closed due to the drought. SWIMMING - A swimming beach is open during the warmest months of the year. 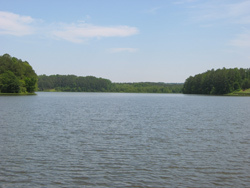 FISHING - Lake Allatoona is a popular place to fish. Anglers try their luck from the shoreline and from boats. Georgia fishing laws are enforced, which means if you are over 16 years old you must have a license to fish. Picnics / Parties - OUTDOOR PICNIC SHELTERS - There are seven covered picnic areas. They are $40 per day and include barbeque grills, picnic tables, and trash cans. This fee is in addition to the per vehicle charge for entering the park. Red Top Mountain also has two GROUP SHELTERS that are great for larger parties $230 - $250). These facilities can accommodate more people (#1 - up to 100 people, #2 - 200 people) than the picnic shelters and are quite nice facilities. They offer a large enclosed space, are climate controlled (both are heated, #1 has air conditioning), have a full kitchen, and their own bathrooms. The namesake of the park, Red Top Mountain, is in the northwestern section of the park. The high iron ore content of the soil on the mountain and in the surrounding area is the reason for the Red Top name. Mining iron ore was once an important activity on Red Top Mountain and in the local area. 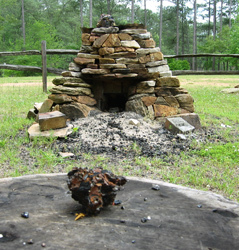 Today you can visit mining related sites in the park and in other public access recreation areas around Lake Allatoona.